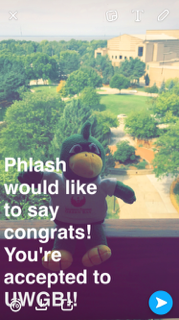 Many of the incoming freshmen starting at the University of Wisconsin-Green Bay (UWGB) in the fall of 2017 will have found out they were admitted to the school through Snapchat. The university launched a pilot program using Snapchat, a photo-sharing app, as an admission notification tool on Sept. 15. Jena Richter Landers, social media specialist at UWGB, explained that students received an email asking if they would like to opt in to receiving messages from the university’s Snapchat account. About 140 have opted in so far, and several batches have already been informed of their admittance. Because UWGB accepts applications on a rolling basis, students can continue to opt in to Snapchat notifications until the school year starts. Although Snapchat is wildly popular among high school students, it is not the only venue alerting them that they have been admitted. UWGB also sends an email and a packet of information through standard postal mail. Richter Landers said that, depending on how often students check email or race to the mailbox, Snapchat could be the place where they hear of their acceptance first. The admittance Snapchat pictures are different every time. 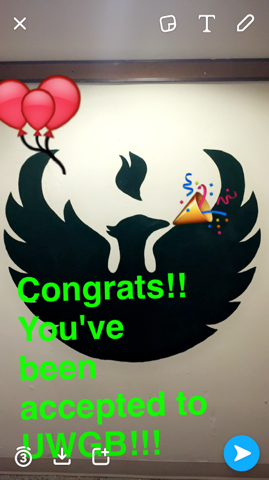 Twice a week, an intern in UWGB’s admissions office designs a custom Snapchat and sends it to the newest batch of admitted students. Richter Landers said that most students who receive these auspicious Snapchats will screenshot the message to preserve it, as Snapchats last for only 10 seconds. She also said that many accepted students will respond to the message with their own excited selfies. Richter Landers said that the Snapchat notification tool was a joint effort between the university’s social media team and admissions office. Admissions officers will pull admitted student data and their intern sends the customized pictures. Twice a year, UWGB does a Snapchat Q&A where students can submit their questions. Richter Landers and her office’s intern respond to these questions. UWGB has 6,760 undergraduate students; 870 are freshmen. While many universities use Snapchat to pique the interest of prospective students and engage current students, UWBG is among the first schools to use the app as an admission notification tool. Richter Landers said that other schools have reached out to her with questions, indicating they may be following suit in the future. “A couple of state universities asked questions, and a few are interested in adopting this in their own way,” Richter Landers said.